Flagstaff is in the heart of the Colorado Plateau, a region known for its rich Native American history and culture left behind more than 800 years ago. Flagstaff is in the heart of the Colorado Plateau, a region known for its rich Native American history. Evidence of the earliest native cultures in the Flagstaff area can be found in the cliff dwellings of Walnut Canyon National Monument and the rock-walled pueblos of Wupatki National Monument where the ancient Sinagua and Anasazi tribes inhabited more than 800 years ago. This Native American heritage still permeates the culture today, as tribal lands cover more than 31,000 square miles (49,890 km2) in this region and are home to the Navajo, Hopi, Havasupai, Kaibab-Paiute and Hualapai peoples. To learn more about the uniquely diverse Native cultures of the Colorado Plateau, visit Flagstaff’s world-renowned Museum of Northern Arizona. Although Flagstaff became an incorporated town in 1894, the modern history really dates back to 1876 when settlers passing through honored the nation’s centennial by raising an American flag up a pine tree. Their “flag staff” became a landmark for those who followed, and eventually became the town’s namesake. The western expansion of the railroad in the 1880s attracted merchants and saloonkeepers to set up shop for the railroad workers and lumbermen. Within a couple of years, Flagstaff was a thriving town of railroad, lumber and ranching industries. Early families such as the Riordans (lumber) and Babbitts (ranching) have descendants who still live and work in Flagstaff today. In the ensuing century since; the Normal School would become Northern Arizona University, Lowell Observatory was established, and the surrounding area became a vast National Forest. Flagstaff’s early history is described in the brochure “The Early History of Flagstaff,” available at the Visitor Center or for download here. Route 66 is synonymous with the classic American road trip, and that carefree spirit is still alive in Flagstaff today. When Route 66 became a highway in 1921, Flagstaff was established as a popular stop on the iconic highway. Famous musical acts making their way to Los Angeles would stop at the Museum Club for a gig, and the Eagles’ classic “Take it Easy” was written by musician Jackson Browne after he found himself “standing on the corner in Flagstaff, Arizona” when traveling Route 66 to California. Winslow, Arizona was easier to sing and made the final lyrics, but Route 66 nostalgia is abundant around Flagstaff. Construction of the modern interstate may have relegated it to “Historic Route 66,” but modern travelers can still enjoy that iconic experience. Flagstaff’s nostalgic Route 66 buildings are described in the self-guided tour brochure “Flagstaff’s Route 66,” available at the Visitor Center or for download here. 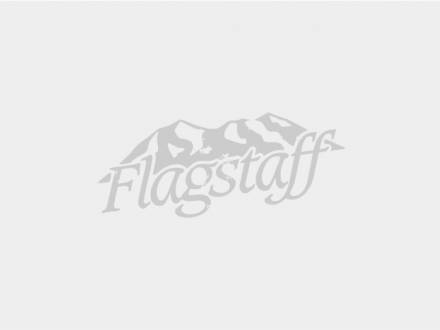 Flagstaff has been known as a town of discovery and innovation for more than 100 years. Here scientists have made discoveries in astronomy, medicine, biosciences and renewable energy. As early as 1894, Percival Lowell located his observatory in Flagstaff, and from the time Pluto was discovered there in 1930, Lowell Observatory continues to be an active research facility while also providing visitors the opportunity to view and learn about our expanding universe. In the early 1960s, Flagstaff played a large role in preparing the Apollo astronauts for their missions to the moon. The U.S. Geological Survey Branch of Astrogeology was established in Flagstaff due to the surrounding number of natural geological landmarks that resembled the surface of the moon. Field training for the astronauts took place at Sunset Crater Volcano National Monument, Meteor Crater, Grand Canyon National Park and other areas in the region. The USGS Branch of Astrogeology continues to be a part of NASA’s exploration of space. While Flagstaff’s past is rich with scientific discovery, emerging research and development companies call the city home, adding to its strong scientific community. Flagstaff’s role in the lunar missions is described in the brochure “Flagstaff and the History of the Apollo Missions,” available at the Visitor Center, located in the historic downtown train station, or for download here.